Kronomyth 2.0: The flowers of Eagles. Souther made a name for himself writing hits for other people. On his second solo album, those names return the favor on a star-studded elpee that includes Don Henley, Glenn Frey, Linda Ronstadt, David Crosby, Peter Asher, Art Garfunkel, Joe Walsh and many more. If you enjoyed the softer side of Eagles, you’ll find plenty of the same, soft country-rock on Black Rose. Souther’s voice isn’t as butter-smooth as Glenn Frey or David Crosby, but it’s at least a tasty margarine most of the time, and the orchestral arrangements sweeten up any sour patches. Although it didn’t produce a hit single, Black Rose is consistently good from track to track. In fact, listening to this record, it’s hard to understand why SHF didn’t make a better go of it, since Richie Furay and Chris Hillman only needed to show up, given what Souther achieves on his lonesome here. 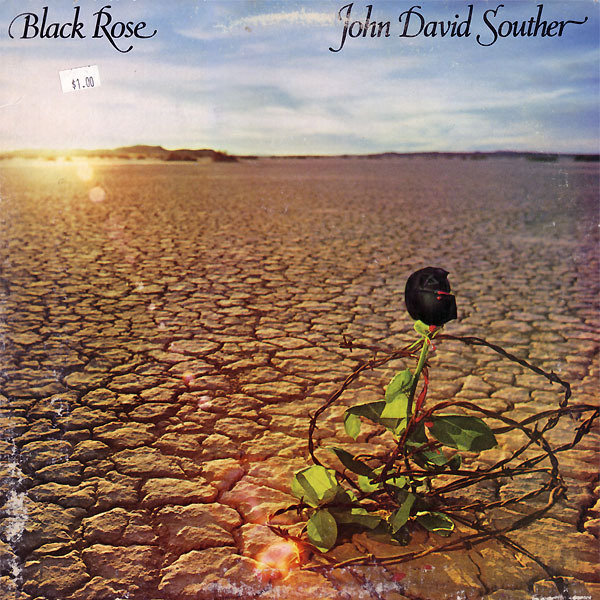 Where his debut was an acoustic country-rock set, Souther rocks a little harder on Black Rose. The obvious reference points for me are Eagles and CSN, not surprising given the players involved. Highlights include “Faithless Love” (popularized earlier by Linda Ronstadt), “Black Rose” (featuring Henley and Frey on backing vocals but sounding mostly like a lost CSN track) and “Banging My Head Against The Moon” (the album’s most upbeat track, with David Crosby and Art Garfunkel on backing vocals), although as I said there isn’t a bad song in the batch. Will it make you forget about Hotel California? No, of course not. But it’s a better showing than Hillman’s Slippin’ Away and a nice respite from overplaying your Eagles records. All songs written by John David Souther. John David Souther (vocals, acoustic guitar, backing vocals, congas, ARP string ensemble), David Campbell (viola, string/horn/woodwind arrangements, conductor), Kenny Edwards (bass), Andrew Gold (piano, electric piano, ARP string ensemble, electric guitar, background vocals, tambourine), Dennis Karmazyn (cello), Charles Veal (violin, solo violin, viola) with Peter Asher (background vocals, electric piano, cabassa, shaker), James Bond (double bass on A4), Mike Botts (drums), Donald Byrd (fluegel horn on B3), Stanley Clarke (double bass), Ronald Cooper (cello), David Crosby (background vocals on A1/A5), Vincent De Rose (French horn on B2), Ned Doheny (background vocals on B5), Chuck Domanico (bass on B4), Robert Dubow (violin on A2), David Duke (French horn on A4, tuben horn on B2), Earl Dumler (oboe & flute on A4), James Dunham (viola), Glenn Frey (electric guitar on A2, background vocals on B5), Art Garfunkel (background vocals on A1), Lowell George (slide guitar on B3), Pamela Goldsmith (viola), John Guerin (drums on B4), Don Henley (background vocals on B5), Ray Kelly (cello on A4), Jim Keltner (drums on A1/B5), Danny Kootch (electric guitar, guitar solo), Russell Kunkel (drums on A2/B4), Kathleen Lenski (violin), Don Menza (alto flute on A4), Roy Poper (fluegel horn on B2), Linda Ronstadt (harmony vocal & background vocals on A2), Sheldon Sanov (violin), Harry Shlutz (cello), Hairn Shtrum (violin), Paul Stallworth (bass on A1/B5), Waddy Wachtel (electric guitar), Joe Walsh (slide guitar on A5), John Wittenberg (violin on A2). Produced by Peter Asher; engineered and mixed by Val Garay. Cover concept by John David Souther. Art direction and design by Jimmy Wachtel. Photography by Lorrie Sullivan. Released on elpee, cassette and 8-track in April 1976 in the US (Asylum, 7E-1059/M5E 7E 1059/ET-81059), the UK (Asylum, K 53037), Canada (Asylum, 7ES-1059) and Japan (Asylum, P-10202Y) with gatefold cover; reached #85 on the US charts. 8-track features different track order. Re-issued on compact disc in the US (Elektra, 1059).